(Newser) – Among their 1,000 pages, the newly found diaries of Holocaust architect Heinrich Himmler track his hourly schedule—filled with activities both mundane and grotesque—over the years 1938, 1943, and 1944. 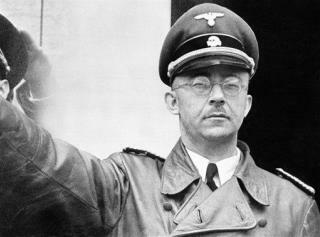 The Jewish Chronicle reports that some of Himmler's diaries were discovered in the 1950s, and hundreds of letters surfaced in Tel Aviv more recently; these "service diaries" were reportedly taken by the Red Army, archived in Podolsk near Moscow, and forgotten. Germany's Bild newspaper on Tuesday began serializing the diaries, and the Times of London has details. Himmler began many days with a lengthy massage in an effort to assuage chronic stomach cramps. Hours of meetings would follow (one entry shows 19 policy meetings in a four-hour span); meetings occurred with 1,600 people over the course of the diaries. Can we find Heydrichs diaries,that's the ones with the plans! "The banality of evil". It is so too bad humanity never, never learns from it. As we all know, whoever fails to learn from the past is doomed to repeat it. So obvious in our over crowded world now.